In the ever-competitive smart speaker wars, Google may soon have a new entrant to take on the likes of Amazon Echo, giving you thorough in-home Wi-Fi coverage to boot. The search giant is apparently pondering an updated Google Home that features "built-in mesh Wi-Fi networking", according to The Information, speaking to a person with knowledge of Google's plot. Google Home 2, as we'll call it, would essentially be aping the core feature of the Google Wifi router, delivering a one-two punch of smart speaker assistant and in-home internet service in a single package. This we can get behind: we liked Google Wifi for its simple set-up and capable coverage so much, we gave it an Editor's Choice rating in our review. And Google Home is no slouch; though it's still got a long way to go, it's already an impressive helper backed by Google Assistant that will only get better with time. However, a big question on the rumored device is how much one – or multiple – will cost. Let us explain: while a single Wifi puck sells for $129 (£129, around AU$167), you need more than one to make a mesh. A trio of Google Wifi retails for $299 (about AU$389), and in the UK two units are sold for £229. 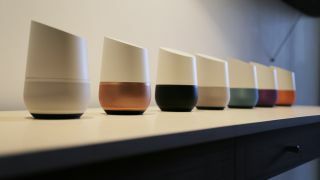 Google Home, meanwhile, costs $129 (£129, around AU$170). The new Google Home 2 price could already be higher if it offers more features (such as voice calling and multiple user support), and if you need more than one to create a Wi-Fi network, you could be forking over quite a bit. Google is generally price conscious with its products, so an exorbitant amount isn't likely. Still, the price of more than one Google Home 2 could give users pause before purchasing, especially considering Amazon Echo is still only $179 (£150, around AU$230). If a Google Home 2 with Wi-Fi is in the works, chances are we'll see it at May's Google IO 2017 developer conference, with it going on sale soon after.